Why Would You Need To Label Your Canning Jars? 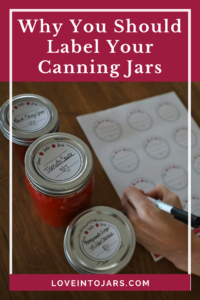 This post will explain why you need labels, how long canned food lasts in the jar, how to get organized with labels and a canning log, and the importance of dating your canning jars. 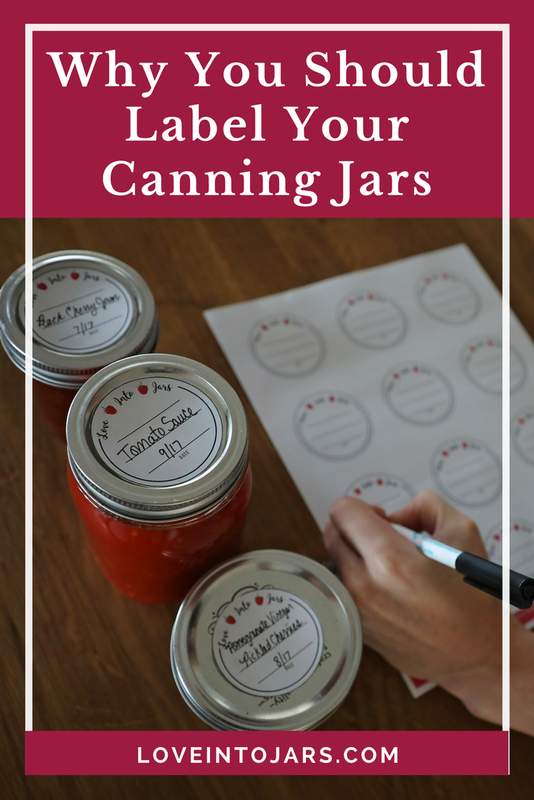 Read on for Why You Need to Label Your Canning Jars! Why would you need to label your canning jars? Tomato sauce looks a lot different than maple whiskey peaches, right? It sure does but tomato sauce made with zero jalapeno is a lot different than one made with one jalapeno- just ask my five year old. Raspberry jam, strawberry jam, cranberry lemon jam all start to look the same on the shelf after a while as the vibrant colors fade a tiny bit (which is completely natural and normal) which makes labeling necessary. The most important reason to why you need to label your canning jars is safety. The flange on canning lids slowly breaks down over time so even though the jars from 10 years ago that you find on granny’s shelf look ok, they aren’t probably safe to eat, even if they were a high acid recipe, because the seal has slowly deteriorated over time. That deterioration means that oxygen and/or spoilers have gotten in the jar and possibly set up shop inside on the salsa. The better organized your canning bounty, the more efficiently you’ll can the following season. 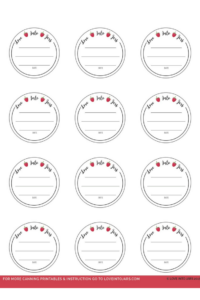 I suggest you download this free Canning Log to keep track of which canning recipes you love, which you didn’t and why. Next season, when you look at your neatly labeled jars on the shelf, you’ll know why you still have several jars of salsa left (too spicy for the kids) or zero jars of raspberry jam left (kids loved it!). You’ll check the log to see how many batches you made, which recipe you used, any notes you made (how long it took you at the berry patch to pick that many berries, for example) and you’ll be canning smarter, not harder. If you use Ball Brand Sure Tight new lids, their official recommendation is 18 months. It is suggested that the rings be removed, the jars be dried, and the jars be stored without rings so that should a seal fail, you’ll know it by the mini-volcano of mold erupting from the jar. (Note: I’ve never had this happen but this practice would be a wise one to adopt.) Drying the rings prevents them from rusting as well. Their regular, older model lids can be sealed safely for one year. Canning jars should be stored out of direct light to protect vitamins, nutritional value and color. Color matters when serving picky kids and giving your canned items as gifts and I LOVE being able to give a beautiful jar of something I’ve preserved as a hostess gift. Do your best to store your nicely labeled jars out of sunlight. 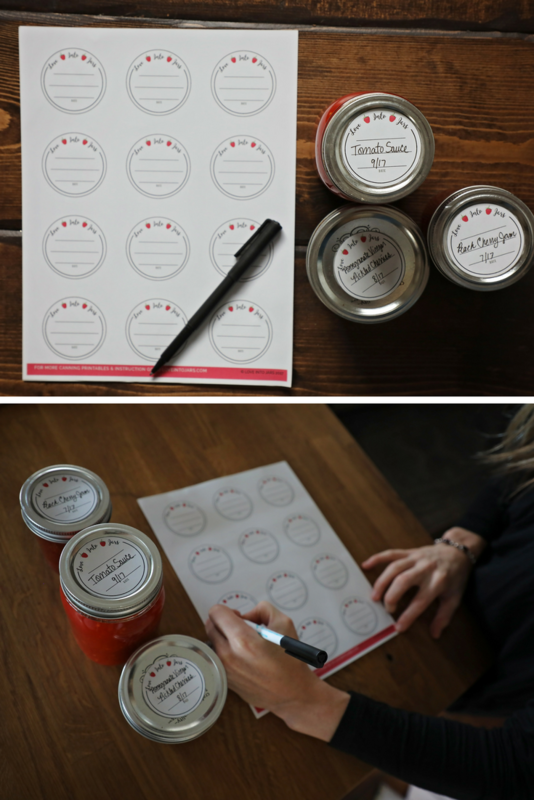 Label home canned food with these beautiful, versatile, and giftable Love Into Jars Labels! They are 2 inches, which means they fit on either a regular mouth or a wide mouth lid, or on the side of the jar, and have space to write the contents and the date. I used to think I’d remember when I canned what…and that’s a silly thing to think. One jar of strawberry kiwi lemonade concentrate looks exactly the same as another, and the date tells me when I canned it. I write just the month and year, never the day, because I honestly rarely know exactly what day it is since I had kids. So I’d write Pickled Pearl Onions 5/17 in my neatest handwriting on my Love Into Jars Labels, in a fine tip Sharpie or a regular ball point pen. I mention the neat handwriting & pen choice because after you open the jar, it serves as the lid for the refrigerator life of the jar as well…so my husband will open the jam to make his toast, potentially smearing peanut butter on the lid in the process…I may drip coffee on the lid when I’m rushing around getting the kids out the door on the way to school…this is real life, Wildflowers. You’ll want your Love Into Jars Label to be easily read for a while after the jar is opened too. Yep, you can use a lame black sharpie on the top of your lids but then, when you want to grab a useful, beautiful gift of ranch-style salsa or strawberry rhubarb syrup to gift your lid doesn’t exactly match the effort inside, does it? The lovely label matches the labor of love inside and sets you up for gifting success. I hope you see Why You Need to Label Your Canning Jars. You need labels for safety, for organization, and for sanity so you can tell the difference between similarly colored jars. 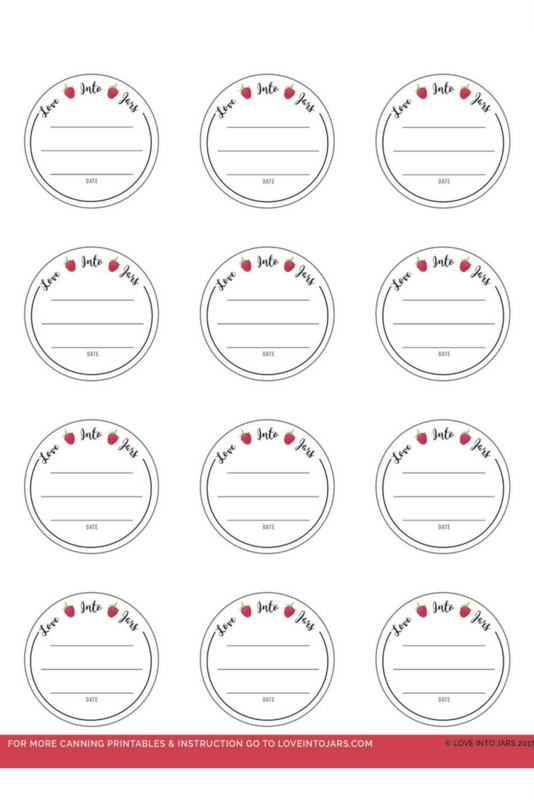 Grab a sheet of the Love Into Jars Round Canning Labels and print them on your regular at home printer on regular paper OR on an Avery Label Template 22807. They fit on regular or wide mouth lids, or on the side of any jar. They have plenty of space to write, plus there’s room to punch a hole if you’d like to tie them on with a ribbon. 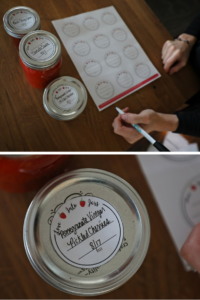 They make gifting the love you’ve put into jars a touch more personalized. I know you and your jar recipients will love them!